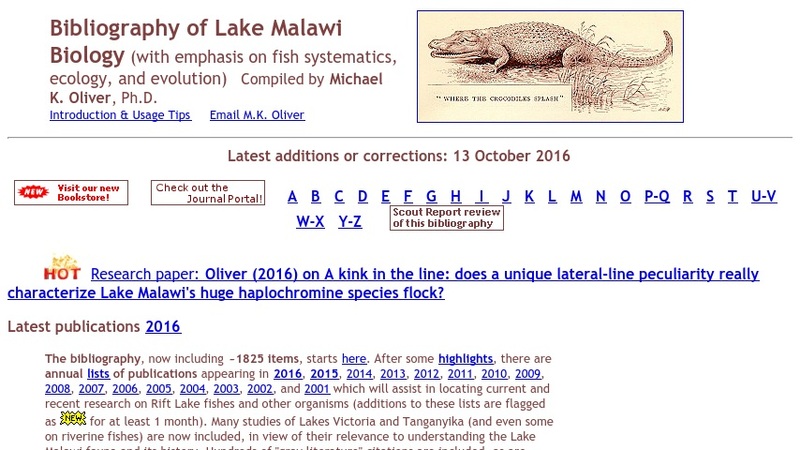 This extensive, online Bibliography of Lake Malawi Biology is part of a larger scientific website titled The Cichlid Fishes of Lake Malawi, Africa (reported on in the March 4, 1998 Scout Report for Science & Engineering) which is maintained by Michael K. Oliver. The regularly updated Bibliography has an emphasis on "the taxonomy of the lake's fishes and their ecology, evolution, and genetics, but also includes literature on all other organisms." The Bibliography "provides links to hundreds of literature abstracts and dozens of full text downloads." The well-organized Bibliography contains an alphabetized list of references with hyperlinks to different alphabetic sections. Preceding the alphabetical list is a selection of highlighted publications from a range of years, as well as annual lists of research publications from 2001 to 2005. Oliver has certainly compiled a very useful resource for ichthyologists and other biologists interested in the African Great Rift Lakes.